Reminder: That's shipped to suppliers, not consumers. Some members of the supply chain may have begun floating shipment numbers for new Nintendo hardware to release in 2016. According to the Taiwanese newspaper DigiTimes, the new system would enter production at the end of the 1st quarter of 2016 - whether fiscal (April - June) or calendar (January - March) is not specified - and would ship between 10 and 12 million units in the first year. Some things to play when the uncle crosses the line twice. Prepare to get Heracrossed up by some of these puzzles. The newest Pokémon puzzle title has its launch date. The Pokémon Company confirmed the free-to-start puzzler will be available starting next Thursday (December 3) in both the North American and European eShops. Total comments: 1 Source: vBlank. Following the success of Retro City Rampage, its sequel will hit the islands on 3DS. The Nintendo fan newsletter has announced a National StreetPass Weekend will be held in North America from Thursday to Sunday (26th - 29th). As with previous weekends, Nintendo Zones across North America that normally send data for the last six players that passed it will randomize the tags sent out. You can find your nearest Nintendo Zone here. "Mr. Judd, wear down this wall." The bi-weekly Splatoon update tonight will bring a new favorite son for bucket fans. Coming to the rotation at the standard time regular update of 9 p.m. Eastern (6 p.m. Pacific) is the Slosher Deco, a modified version of the existing Slosher that uses its arc to evade Splash Walls. As a taunt to the above, the Slosher Deco packs a Splash Wall sub to go along with a Kraken special. And it looks like this one won't wipe your save file. Another Splatoon update will drop this week in the form of the Hydra Splatling. The long range weapon fires ink in a similar fashion to a fire hydrant, but it's balanced by a long charge time. It brings the Splash Bombs as a sub and the Echolocator special. The weapon will come at 11 a.m. JST tomorrow, or 9 p.m. Eastern time. No, the Canadian Mario Tennis and Stella Glow prices aren’t a typo, man. For those who can't handle Toby the Plane but still want the cuteness. The standalone Chibi-Robo Amiibo will be available for preorder today at Amazon for North American customers. Preorders will open at 5 p.m. Eastern / 2 p.m. Pacific at this link, and the figure will retail for standard US Amiibo price of $12.99. No such listing has been made available for Canadian residents. Nothing like a little horror to go with your holiday cheer. Renegade Kid has provided updated dates for a couple of upcoming titles. Dementium Remastered, the updated version of the DS horror title, has completed NOA lotcheck and will release on December 3, according to a video on the Renegade Kid Youtube channel. Unlike the Moon Chronicles, this remaster will be sold as a single package. 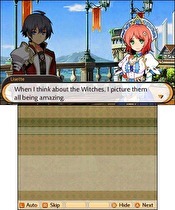 The action RPG basically features any job you'd care to work in the world of Final Fantasy. Final Fantasy Explorers, the action RPG due out on January 26, 2016 on 3DS, will feature 21 different job classes when it launches, including your regular Knight, Thief, and Mage classes, as well as Bard, Machinist, Beast Master, and more. The Blue Mage and Samurai jobs will be included with the release on January 26, 2016 after appearing as DLC in the Japanese version. Sheldon's got the deets later, but we've got them now. The Splatoon update train will keep rolling tonight US time with the Bamboozler 14 Mk II. A modified version of the Bamboozler appears to be firing at a longer range than the standard version, and has a slightly different physical appearance. It packs a Disruptor for a subweapon and a Echolocator special. Woolly World climbs to the top of the yarnball. The month of October was scary for Nintendo hardware sales in the United States, but some nice treats came on the software side. Get a month of WWE Network or an old Pokémon game? Tough call here. Amazon has listed preorders on their digital store for next February's anniversary re-release of the Generation I Pokémon games, and it appears adding wireless function may cost more than was initially thought. A 3rd wave of Animal Crossing characters may be coming. Updated Amiibo kiosks in North American retailers have revealed a few new Amiibo, and a couple of retail exclusives. Target has revealed the Famicom-colored R.O.B. will be sold in America, and new Animal Crossing Amiibo will be made for Kapp'n, Rover and Timmy and Tommy Nook as a single Amiibo. 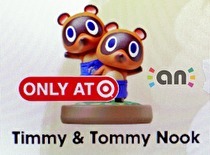 The Nooks will be a Target exclusive. Nintendo cops another Developer of the Year nomination. The nominees for The Game Awards have been announced and Nintendo games have picked up several nominations. Nintendo has been nominated for Studio of the Year, along with From Software (Bloodborne), Kojima Productions (Metal Gear Solid 5), Bethesda Game Studios (Fallout 4) and CD Projekt Red (The Witcher 3). Several games for Nintendo systems have also copped nomination, including a clean sweep of the Best Family Game nominations. Donations under $50 will be laughed at, but kept. Nintendo appears to be going in heavily with deals on Black Friday and US Thanksgiving week. A heavy North American eShop sale will be on from November 25 - December 2. Although no games in specific are mentioned, deals will allow us to "save up to 50 percent on dozens of the best-reviewed games for the Wii U console and Nintendo 3DS family of systems". The list of games will be posted here on the day the sale begins. And the next Smash video comes with it. The newest 3rd party Super Smash Brothers has been announced, and neither squall nor lightning will stop him. Cloud, originally from the 1997 PlayStation title Final Fantasy VII, will join the Super Smash Bros roster. No date has been announced, but it will also bring a stage based on the Midgar area of the game. Cloud was shown using some of his trademark moves, including summons and his Omnislash Limit Break as a Final Smash. The worst kept secret in Nintendo history is official. The Nintendo Direct opened with the reveal of the previously-leaked The Legend of Zelda: Twilight Princess HD. The remake will launch on March 4 and appears to be a remake of the 2006 GameCube version of the title. In addition, a Wolf Link Amiibo was announced to coincide with it, and data from the game will work with the original Zelda Wii U game releasing later in 2016.